A Fount of Fonts | Subjonctif. Reposted from A Pixel, A Vector, A Blog. Being the typography nerd that I am, I am always in search of new fonts to add to my resource library. And being the typography purist that I am, I try as best I can to avoid downloading poorly executed TrueType display fonts from any of those free sites. Very few of them are designed with decent kerning pairs, let alone allow you to copy the files into an InDesign package for portability. Sadly, being a design student doesn’t afford me the luxury of purchasing font sets at will from The Real Type Foundries. Last week I was fortunate enough to be gifted the Adobe Font Folio OpenType Edition, and you must be able to imagine my sheer glee at adding so many type families to my font library. The thought of having so many choices for my projects just thrilled me to no end, but the prospect of filtering through over 400 families as I decided which to install and which to leave out was rather daunting, so I let the enticing collection be for a few days while I hammered out how best to approach the task. It was Monday morning before I finally decided to just dump them all onto my computer and sort them out later. Eager to multitask, I selected all the files and dragged them over to Font Book, then proceeded with getting ready for work. A few minutes later I checked back on the process, only to be met with that lovely spinning beach ball and no visible progress on the install. I crossed my fingers and ran to catch my bus to work. Yes, I had forgotten that when you drag a font file into Font Book, it opens a preview window and lets you view the font before installing it. 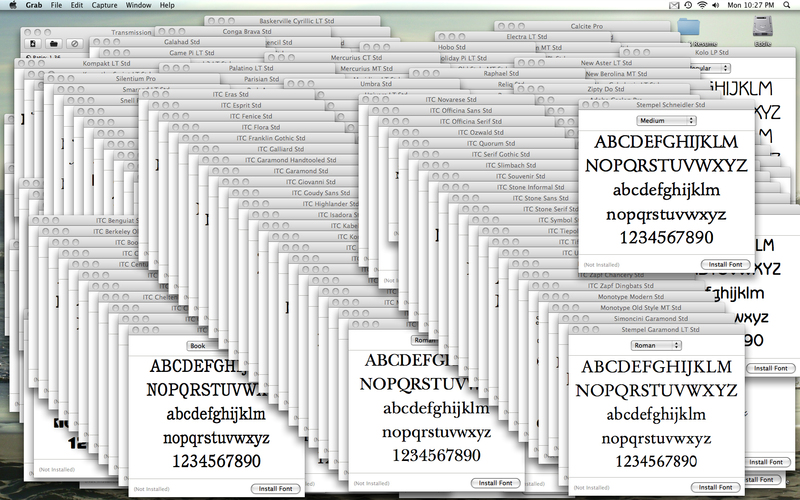 I had no less than 420 font preview windows cascading across my monitor! I could do nothing but sit there and laugh hysterically at my lapse in memory. Sadly, I then proceeded to go through them one by one and decide if I actually wanted to install them (it took over an hour). Now that I’ve completed the initially daunting task, my type resources will never be lacking. Frankly, I’m overwhelmed. But being the typography nerd that I am, I giggle with joy at the thought of having all these fonts at my fingertips. And being the typography purist that I am, I rest easy knowing that each of these fonts are in OpenType format, and that they were good enough for Adobe, so they must be good enough for me. I also take comfort in the fact that none of those 420 fonts were Comic Sans. In this line of work, one can never have too many fonts. I fully acknowledge and accept that there are now fonts in my library that I will never use. And I’m okay with that, because as a typography nerd and a purist, I will take the freedom associated with an abundance of choice over feeling restricted in my creativity by what few choices I have any day.